McFarlane Toys has released an official photo and details for the Stranger Things Season 2 – Ghostbusters Costume 4-Pack. 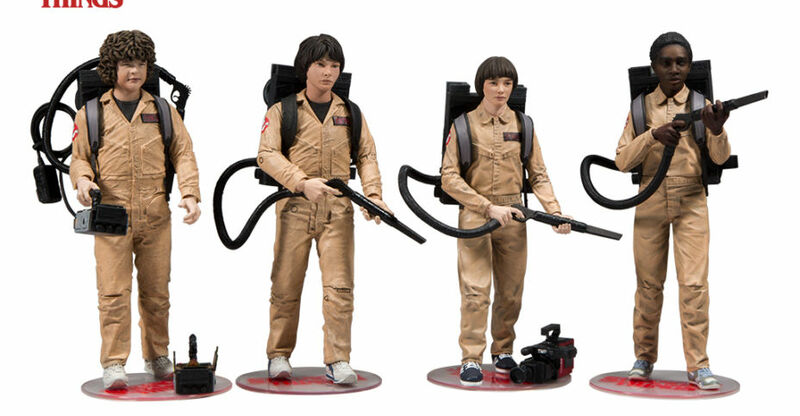 This set, which we last saw at at Toy Fair 2018, includes Mike Wheeler, Will Byers, Lucas Sinclair, and Dustin Henderson in their Ghostbusters Halloween Costumes. The set is priced at $69.99 and is a GameStop Exclusive. It is scheduled for release on October 15th. You can pre-order it Here. Click the banner for a larger image. Mike, Will, Lucas, and Dustin return in season 2 of the Netflix hit series, Stranger Things with a bang. One gloomy Halloween night in Hawkins,Indiana, Mike, Will, Lucas, and Dustin decide to dress up as their favorite characters from the iconic movie but little do they know that Halloween will never be the same again. 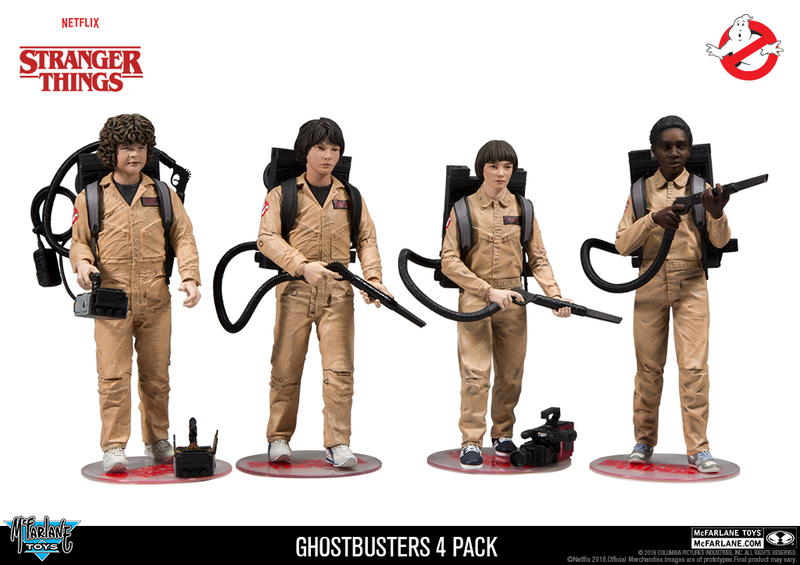 The Ghostbuster Deluxe Box features the 4 fan-favorite characters in the iconic Ghostbuster jumpsuits that were made so popular in the 1984 hit movie, Ghostbusters. Features authentic hyper-realistic paint decoration of the iconic jumpsuits worn by the original Ghostbuster cast. Can't wait to grab this set. I own the other figures in McFarlane's Stranger thing line minus the demogorgon and they are some pretty well put together figures with great accessories, articulation and pretty amazing likenesses to boot. As of this post I've never seen an episode of the the Netflix series, but these figures look to good to pass up, plus they make for good stand-ins for the losers club kids from IT so that's a bonus. These are the only McFarlane toys I own, but these Stranger Things offerings are comparable to some of NECA's and Diamond Selects offerings. If they kept making sets with this kind of quality for all their lines I'd be buying more from them. The Demogorgon is awesome. It's one of their best 10" figures so far. Complete all 4 kids in Ghostbusters suit. This sure is irresistible! And the price is very nice. Question, for my own curiosity. What appeal does the set hold for someone who hasn't seen the series? Just a big Ghostbusters fan, or? It's great to see people enjoying it on any level, I was just wondering. It's a really good show! I'm just a fan of well made action figures. If I find a toy to be really cool or if it fills a void in my collection then I'll buy it regardless of property or recognition. For example bought the entire collection of Diamond Selects Gotham line simply because I wanted well articulated figures of generic looking cops and thugs to play with along side some of my horror or alien creature action figures, plus the accessories are just too nice! I've never seen Gotham either. I even bought the entire NECA Twilight line which I've neither seen nor read just to have teenagers for Freddy, Jason and other horror icons to hunt. The way I see it I can't just have a bunch of creatures, robots and/ or action heroes without some otherwise normal looking figures to help elevate them. I can get behind that logic, last week I bought the giant mutated crocodile from Rampage because my toys needed a giant monster to fight. Was just wondering how the Ghostbusters kids fit into that without any attachment to the show. Works for me!